Donna Hay's cookbook Fresh and Light is the quintessence of 21st century cuisine. She offers a joyful, varied and sensible kitchen that gives an alternative to the current trend of restrictive cooking, wheat-free, sugar-free, lactose-free, gluten-free, fruit-free, to name a few. She invites to use fresh, seasonal and regional products, and substitutes traditional ingredients for their healthier equivalent. Donna made sure that all her recipes are easy and quick to prepare. After all; overly complicated cooking instructions just make convenience food seem all the more appealing. Heat a large non-stick frying pan over high heat. Add the oil, cumin, paprika, salt and ground fennel seeds. Cook for two minutes or until fragrant. Add the chickpeas and cook, stirring, for 5 minutes or until the chickpea are toasted and coated in spices. 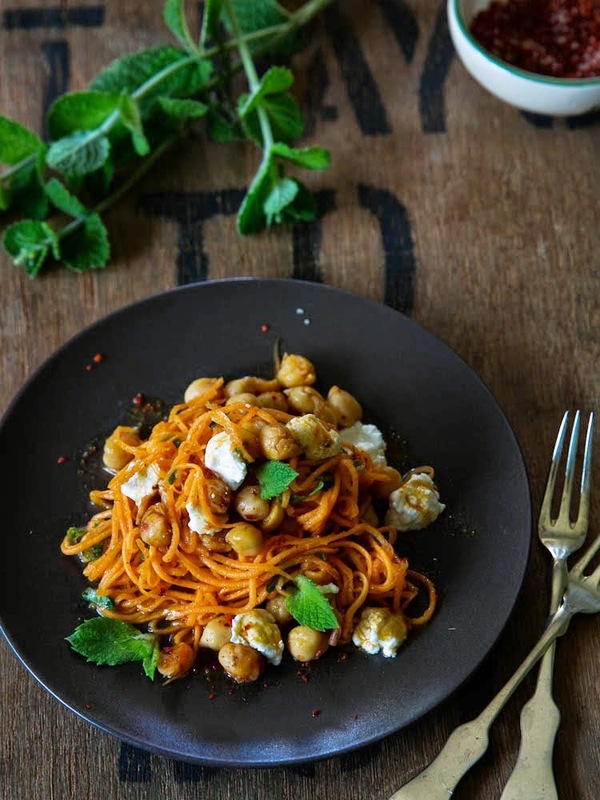 Place the carrots, coriander, mint, lemon juice, honey and extra olive oil in a bowl and toss to combine. Add the chickpeas and mix in gently. Divide between serving plates and top with the dollops of goat cheese.